2 Bed, 2 Bath, Golf Course Lot, Water and Mountain Views in SunBird Golf Resort, Chandler. Enjoy sitting on your South Facing Patio with a Spectacular view of the Golf Course, Water, Mountains and Sunsets. Home is Move in Ready. 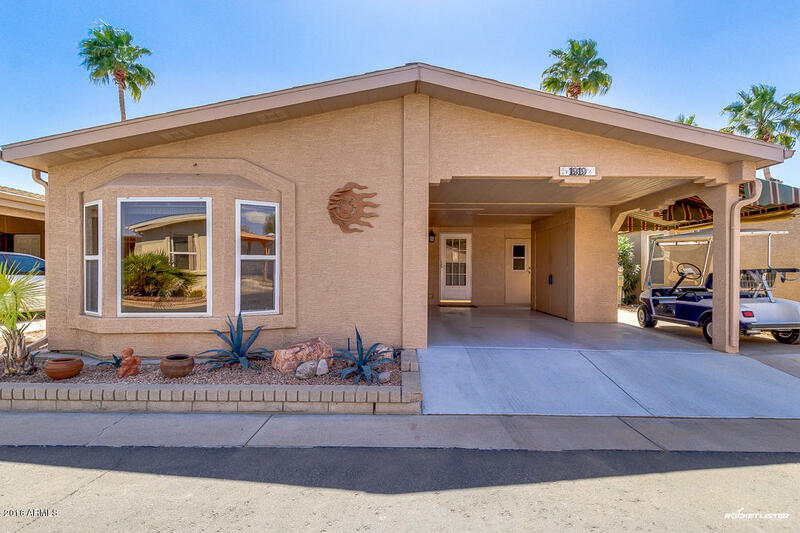 Updates Include: Vinyl Windows, Re-Plumbed, Refrigerator, A/C, Stucco Exterior, Covered Patio with Concrete Coating, Golf Cart Driveway and Canopy, Concrete Ribbon and Sidewalk, Roof Fan, Storage Sheds and Storage in Carport Ceiling with Drop Down Stairs. Amenities: Executive Golf Course, Driving Range, 43,000 sqft Clubhouse, 7,600 sqft Ballroom, Restaurant and Bar, Heated Pool and Spa, Health Club, Billiards Room, Tennis, Pickleball, and Bocce Ball Courts, Post Office, Library, Lapidary, Ceramic and Craft Room, Bike/Walking Paths, Fish Lakes and Horseshoes.